The Church of the Savior on Spilled Blood is one of the main sights of St. Petersburg, Russia. 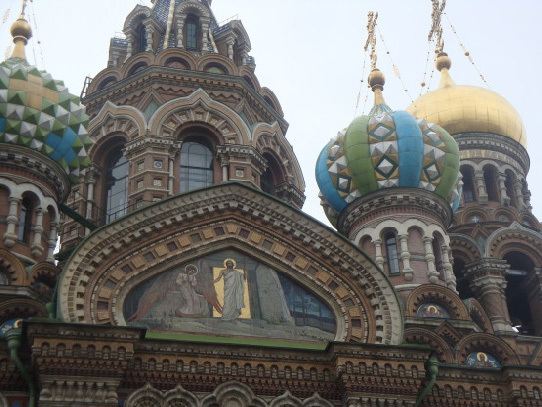 Other names include the Church on Spilled Blood, the Temple of the Savior on Spilled Blood , and the Cathedral of the Resurrection of Christ. To save the decoration of the temple from the Communists, the townspeople took off his crosses and lowered them to the bottom of the Griboyedov Canal. Subsequently, when the danger has passed, and the Saviour on Blood began to restore, but could not find the crosses that were crowned with the temple, there was a curious case: a casual passer-by, who knew the legend, went to the team of restorers and advised to look for the decoration in the water. The workers decided to try and sent a team of divers to survey the channel bottom. To everyone’s surprise the crosses were exactly where pointed stranger. 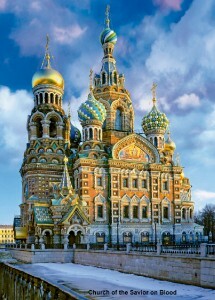 The Church is prominently situated along the Griboedov water Canal; paved roads run along both sides of the canal. On March 13, 1881, as Tsar Alexander’s carriage passed along the embankment, a grenade thrown by an anarchist conspirator exploded. The tsar, shaken but unhurt, got out of the carriage and started to remonstrate with the presumed culprit. A second conspirator took the chance to throw another bomb, killing himself and mortally wounding the tsar. The tsar, bleeding heavily, was taken back to the Winter Palace where he died a few hours later. Cathedral of the Resurrection of Christ was the only one, along with the St. Isaac’s Cathedral, St. Petersburg temple, which were in the state maintenance. The cathedral was not a parish; he was in charge of the Ministry of Internal Affairs and was not designed for mass visits; The entrance is on the cards. In it were made individual service dedicated to the memory of Alexander II and preach daily. 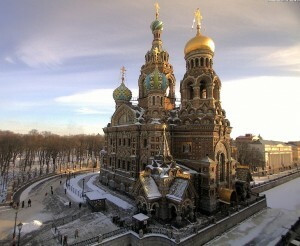 Architecturally, the Cathedral differs from St. Petersburg’s other structures. The city’s architecture is predominantly Baroque and Neoclassical, but the Savior on Blood harks back to medieval Russian architecture in the spirit of romantic nationalism. 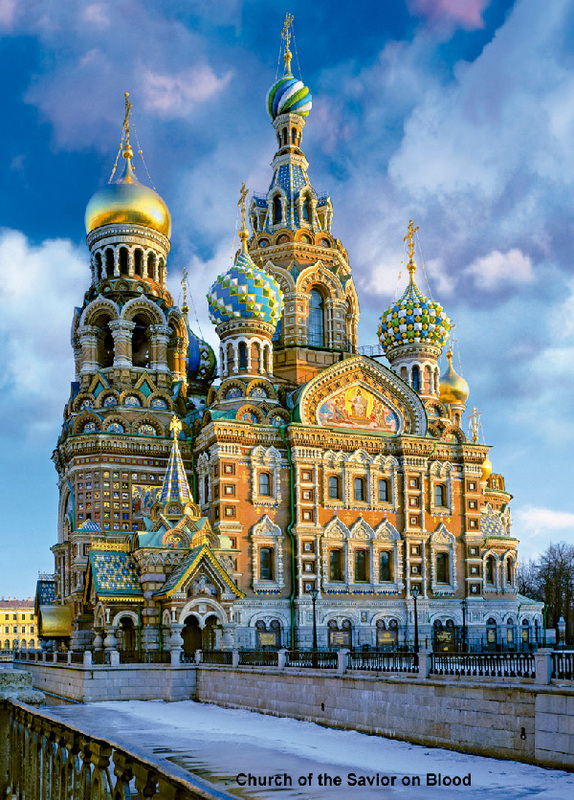 It intentionally resembles the 17th-century Yaroslavl churches and the celebrated St. Basil’s Cathedral in Moscow. The Church contains over 7500 square meters of mosaics—according to its restorers, more than any other church in the world. This record may be surpassed by the Cathedral Basilica of St. Louis, which houses 7700 square meters of mosaics. 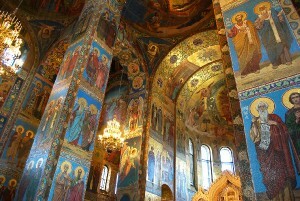 The interior was designed by some of the most celebrated Russian artists of the day—including Viktor Vasnetsov, Mikhail Nesterov and Mikhail Vrubel — but the church’s chief architect, Alfred Alexandrovich Parland, was relatively little-known (born in St. Petersburg in 1842 in a Baltic-German Lutheran family). Perhaps not surprisingly, the Church’s construction ran well over budget, having been estimated at 3.6 million rubles but ending up costing over 4.6 million. The walls and ceilings inside the Church are completely covered in intricately detailed mosaics — the main pictures being biblical scenes or figures — but with very fine patterned borders setting off each picture. The cathedral attracts numerous decor – sculpted architraves, innovative features, filled with mosaic inserts, belts, tiles, colored tiles. Of particular interest is covering five chapters Cathedral jewelry enamel area of ​​1000 square meters. The first widely used and exterior decoration of the building with mosaic! In memory of the martyr’s death of the Emperor Alexander II on the site of his assassination built the temple. He was consecrated at his grandson as the Church of the Savior on Spilled Blood. People who self-proclaimed spokesmen of the popular will, mortally wounded Alexander II of, Russian Emperor, called the people of the king-deliverer. Heavy wound received all Russia. It does not become emperor, to a large extent reflected the aspirations and hopes of advanced Russian people, Russian intelligentsia.